Classic Sci-Fi: THINGS TO COME | Warped Factor - Words in the Key of Geek. Matthew Kresal looks back at H.G. Wells 1936 classic, Things To Come. Released eighty years ago this month, Things To Come has cast a long shadow over the science fiction genre on film. Not only through its iconic, art deco influenced production design and costumes but as something of a historic piece if only for who wrote its screenplay: H.G. Wells, one of the genres founding literary fathers. Given the eight decades that have passed, how well does the film hold up? Certainly Things To Come brings together some of the finest actors Britain had to offer at the time, often playing multiple roles. Leading the cast is Raymond Massey as John Cabal and his descendant Oswald, who are very much at the heart of the events portrayed in the film as John first goes to war before becoming the architect of the government that Oswald will come to lead. Ralph Richardson appears in the middle part of the film as The Boss, the war lord dictator of 1970 Everytown, who stands in the way of John Cabal's visions. Also of mention are Margaretta Scott playing one of the very few female roles in the film as the wife of the Chief, Maurice Braddell as Dr Edward Harding who convincingly goes from prewar medical researcher to a tired old doctor in 1970, and Cedric Hardwicke as Theotocopulos, the Luddite sculptor who plays a prominent role in the final section of the film. The acting is, due to the era, theatrical in style which gives it an over the top quality at times but it works for the most part especially for Richardson as the Chief. The production values of the film are rather good for the era. 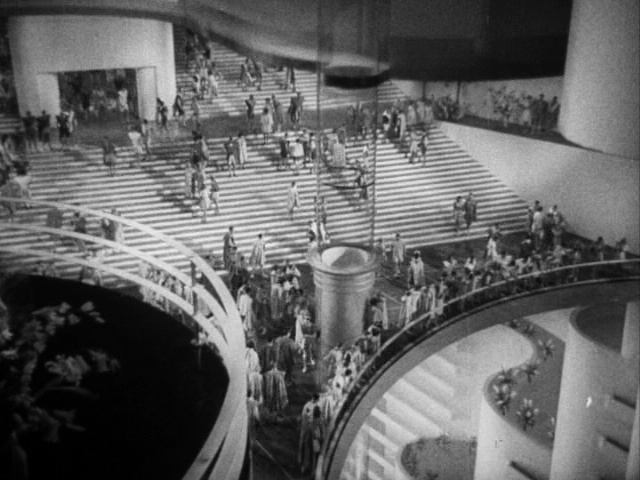 The sets from legendary production designer Vincent Korda are perhaps the film's single biggest legacy as they established the basics of both the post-apocalyptic and “futuristic” design for decades afterwards, as did the costumes used throughout the 2036 section that closes the film. The special effects, on the other hand, date the film heavily with the vast majority of model effects that look like they could have been pulled from the Flash Gordon serials of the era. 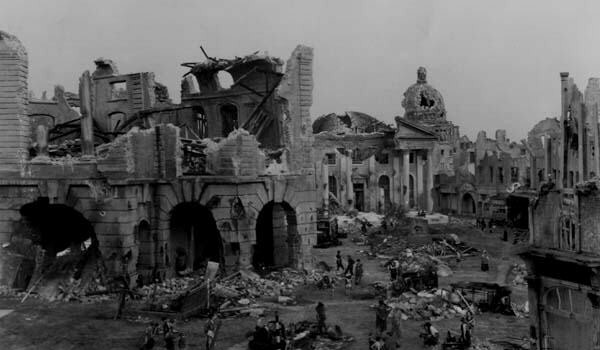 Some of the effects though work, such as an haunting image of a little boy drumming his father off to war as rows of soldiers march across the screen, a section I can only describe as “the Blitz segment” of the 1940 section that is a graphically (for the time) detailed prediction of what was to come just a few years later, the shots of fleets of enemy bombers approaching Britain during the war, and the space gun which (despite taking its lineage from the idea of getting in space with artillery guns) bares a striking resemblance to a modern day rocket and its launchpad tower. There's also a strong orchestral score from composer Arthur Bliss that is put to fine use in the film. The effects might date the film rather heavily, but the production values by and large serve it well. Which brings us to the Wells screenplay. Wells has a reputation as being not just one of the founding fathers of the genre but also for his political leanings left-ward, both of which play heavily into the film. 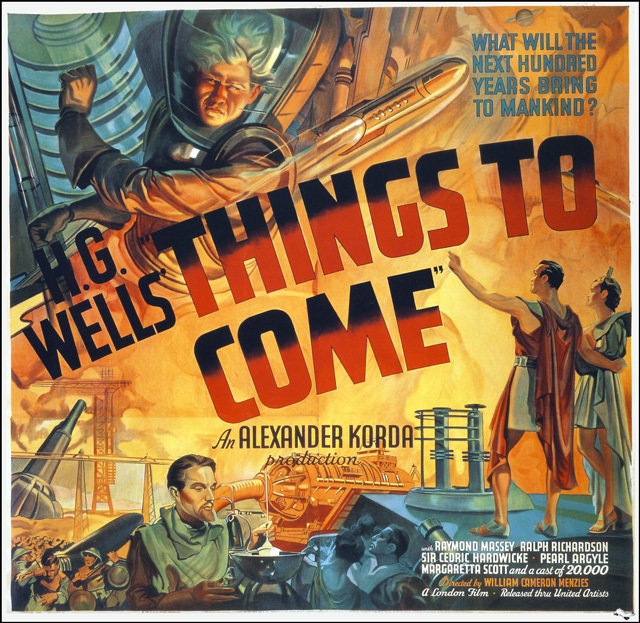 First and foremost, Things To Come can be seen as Wells attempt to predict the future from his viewpoint in the 1930s. From that perspective, it's interesting to note the things that Wells predicted accurately to some degree. Take the Second World War for example. The beginning of which is dated only about fifteen months off with it beginning here at Christmas 1940, while the surprise attack at war's outset that decimates a major portion of the British fleet isn't too dissimilar from the 1941 attack by Japan on the American navy at Pearl Harbor. There's also the London Blitz with its use of the Underground as air raid shelters, the aerial dogfights of the Battle of Britain predicted there in the film, while the future segments presents looks at both television and space exploration. It's off in places but fascinating nonetheless. Then there's the time-frame the film covers. Wells script is an epic tale crossing almost a hundred years from 1940 to 2036 told in three sections (1940,1966/1970 and 2036) as Everytown (an avatar of London) goes through war, plague, desolation and rebirth into a bustling city at the heart of a technocracy with the Cabal family at its heart. While much of the future history didn't come to pass (thankfully) it's interesting to look at the film today not so much as a failed prediction of the future but as an alternate history piece. Which isn't to say that the screenplay is perfect of course. The dialogue betrays the era in which it was written as its almost pseudo-Shakespearean, particularly the long speeches characters have at regular intervals, especially Massey's Cabal characters. Wells' political leanings are also evident from the very start and are echoed heavily by the Massey/Cabal characters who at first (in the form of John) warn about how “if we do not destroy war, war will destroy us” before becoming the architect of the technocratic world government, and (in the form of Oswald) the leader of said government. Wells hopes of a benevolent technocracy are outdated, if not laughable in its naivete, yet given the desolation seen in the 1966/1970 portion, as a plot point in the film it works for the most part. These things though date the film as heavily as some of its special effects. Has time dated Wells and the filmmakers vision of the future? In some ways perhaps Things To Come has dated heavily in places (particularly in its effects and political outlook). Yet in other respects it stands up well from being by and large well acted (if in a theatrical manner) while its iconic production design can still be seen and felt even now, not to mention just how much some of its predictions proved to be eerily accurate. 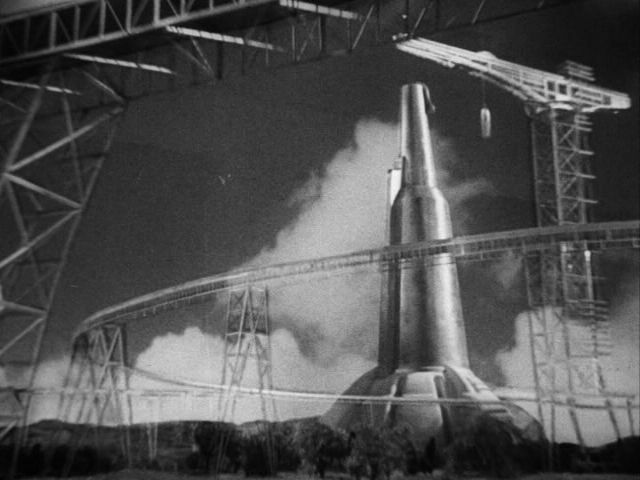 As a result, Things To Come remains a defining piece of science fiction cinema.